Case study – Collection and analysis of in-store data with regard to shelf stock and shelf placement of a specific hair care brand. Thousands of Clickworkers visit retail stores located in their neighborhood and take pictures with their smartphones of the shelves stocked with hair care products. The manufacturer’s brands are marked in the pictures and the pictures are evaluated according to the customer’s KPIs. These evaluations provide the customer current in-store data with which he can verify the compliance of trade agreements and optimize sales promotions. Three of four purchase decisions are taken at the point-of-sale (POS). Those who implement the right POS marketing measures at the POS will have the best business turnover. In addition to the possible use of various promotional resources and activities, optimal shelf placement is still decisive for sales figures. Products are best placed at the shopper’s eye and touch level. A well-stocked shelf is also important because it increases the visibility of the products. Whether and under what conditions the manufacturer obtains this preferred product presentation often depends on their negotiating skills with the retailers or trade chains. However, once the manufacturer has achieved his goal, it is, of course, important for him to know that means employed are invested correctly. The compliance with the relevant agreements as well as the situation at the POS has to be verified continuously in order to ensure a prompt reaction. In most cases, the company does not have enough sales representatives to visit, check and evaluate all the branches of the different chain stores and markets, area-wide and in a timely manner. In all target regions hundreds of Clickworkers swarm out, visit all the relevant stores (which are respectively located in their vicinity) and control the situation at all the points-of-sale for the customer. 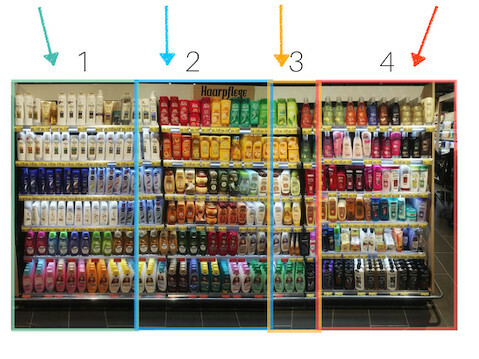 According to specific guidelines, they document the presentation of hair care product at the shelves by photographing them with their smartphones. Up to eight pictures are taken of each shelf – upright and frontal – until the shelf can be displayed completely. The Clickworkers then upload their pictures (with geo position) on the clickworker platform, including information about the business address and the name of the store. The pictures of one shelf are automatically merged in order to create an overall image. All the pictures are now edited and analyzed on the clickworker platform. To do so, Clickworkers count and evaluate all the customer’s products in the pictures, for instance in terms of the number of individual product collections, their placement and their arrangement on the shelf. These evaluations provide the customer timely and accurate in-store data about the presentation of his products in all the branches of the retail chains with whom he has made agreements. If there are negative results, for instance incorrect shelf placement, the customer can quickly contact the responsible retailer to effect optimizations. If some products are not or only sparsely present, improvements can be requested and possible logistics problems can be uncovered and quickly rectified, avoiding sales losses. The project is discussed with the customer; his KPIs are determined and the jobs / tasks arising therefrom are defined. Numerous Clickworkers 1) visit all the relevant stores, which are respectively located in their vicinity, take the pictures of the shelves with the manufacturer’s products as specified and upload them to the clickworker platform. The pictures will be automatically optimized for further analysis. Numerous Clickworkers now 2) analyze the pictures according to the customer’s specifications. The results are delivered to the customer in form of a report.